Glorifying state of Uttarakahnd renowned for the pilgrimage of Life time known as “Chardham Yatra- चारधाम यात्रा”. This Yatra is also renowned among the Hindu Pilgrims and world as Chota Char Dham. Dev Bhoomi, Tapo Bhumi, Land of Sages is among some of the names to which the state is known. It houses numerous majestic and divine shrines, temples and places. The adorable state possesses a distinct place for its culture, natural beauty, spiritual sentiments and rich traditional not only in India but also in the whole world. People of this divine state are too much attached and devoted towards their religious beliefs. The state has the centres of Kumbh, Mahakumbh and world renowned Nanda Devi Jaat Yatra. The land of Uttarakhand is full of sages, saints, pious rivers and miraculous places. Numerous yogis have made the land of Uttarakhand so pious, that people from all around the world come and visit this marvellous state. Haridwar is the first city to visit and is Gateway city to Char Dham Yatra. Haridwar refer as the “entrance to meet Hari or God” or we can say “Entrance of Bhakti and Mukti (Salvation). Situated approx 225 kms of the north west of Delhi, Haridwar is pride of Uttarakahnd. This pious city is well connected by Train and road from all the major cities of the country. Before commencing the the Chardham Yatra one must take a Bath at Har-Ki-Pauri, Haridwar. Taking a dip in the holy water of river Ganga whole soul and body gets purified. This place is also known as Aarti Sthal, here every morning and evening Aarti of Maa Ganga is carried on. Ganga Aarti at the Har-ki-Pauri, Haridwar is considered as the most auspicious event. The image of diety Ganga is beautifully decorated on the Bank and with the resonance of Jai Maa Gange the Aarti started. Close to Har Ki Pauri there is “Kusha vrat Ghaat”, it is also known as “Kusha Ghaat”. Even being so many rivers and places in India the Shraddh (homage to peace of soul of forefathers) at this ghat has its own importance. It is believed that performing the Shraddh at Kusha ghat during sunrise makes the Sun and River witness of the whole act to give the resting souls a divine peace. On the hill nearby Har-Ki-Pauri, Temple of Maa Mansa Devi is a place where every prayer and wish is fulfilled by the Goddess. In this fast running life no one has time for anyone and no one can find the place other than Mansa Devi Temple to open up their heart and wish. As defined from name Mansa means wish of our heart, anything that is been asked with strong belief and pure heart is certainly fulfilled by the goddess. One can also have the glimpse of this temple from Har-Ki – Pauri. On the east from the Ganges at Neil Mountain “Chandi Devi Temple” is among grand and prime temples of Haridwar. On the way to Rishikesh “Shanti Kunj “ is another must visit place in Haridwar. Lok Rishi Shri Ram Sharma Acharya laid the foundation of this place and spreads the message of unity and simplicity to world. This place gives an ultimate peace to the travellers visiting Dev Bhumi. From time to time the organisation also carries on the cleanliness program for river Ganges. After visiting Haridwar now time is to gather all our strength, belief and faith together to start the religious Tour of first highland of Char Dham. There are two routes to start the pious yatra, one goes from Rishikesh and another from Dehradun. The route from Dehradun is easier and best way to start the journey. Starting your journey via Dehradun gives you the opportunity to visit some other unique destinations on the way and hence you can also enjoy the diversity. Dehradun is a beautiful valley and is also state capital. It is surrounded by Mussoorie in the North, Shivalik range in South and North & west of river G+anga and Yamuna. During the period of Mahabharat in search of peace Guru Dronacharya had chosen this place and hence derived its name as “Drona Nagri”. In 1699 Guru Ram Raj stayed here and since from then the name of this place got famous as Dehradun. Starting early morning for the yatra on the way to Mussorrie 10 kms from Dehradun is situated the Siddhapeeth Temple of Prakasheshwar Mahadev of Lord Shiva. Chant of Om Namah Shivae and Bam Bam Bhole mesmerises the surrounding and the devotees coming for the darshan of Mahadev Shiv. Enjoying the panoramic view of valley and hills the devotees reach” Queen of Hills-Mussoorie” which is 34 kms from Dehradun. It is situated 6000 ft. Above the Sea level . Mussoorie is tempting tourist place and was established by captain Young in 1837. Lall Tibba is the highest point in Mussoorrie where one can view the snow capped peaks and Doon Valley. The atmosphere is cool and there is fragrance in the air. Numerous tourists visit this gorgeous hill stations throughout the year. The hill station has many good hotels and accommodation facilities. Every year from April to September flock of tourists congregate here and from October to March tourist visit the place to enjoy snowfall. Enjoying stunning and adorable views of Queen of Hills, devotees head toward the Yamnotri Dham through highway and reaches Kempty fall. It is 13 kms from Mussoorie. This 600 ft. Waterfall is prime attraction among the tourist visiting Mussoorie. 14 kms from here pilgrims reach to Yamuna Pul, here the route diversifies. One route goes to Dehradun via Chakrata and another one heads to Yamnotri via Barkot. From Yamuna pul towards barkot via Nain Bagh the yatra reaches Damta which is a halt point for refreshment and also presents beautiful view. 16 kms from Damta tourist reach Badnigaar. Here the route again diversifies, one goes to Yamnotri via Barkot and another one to Lakha Mandal 3 kms at Jonsar. Lakaha means lakh and mandal means place or area, due to presence of 1.25 lakh Shivlings and images of 33 crore god and goddesses this place derived its name as Lakha Mandal. Just 50 mts from the temple vicinity there is one amazing Shivaling in which while Jalabhishek one can see the replica or image of itself as clear as in mirror. This incredible shivlinga bounds the science to believe on the religious faith. The history of Lakhamandal is dated back to Mahabharta as the impression of Pandavas can be seen on different caves. It is believed that during Agyat Vaas period Pandvas took shelter of these caves. The adorer continues their religious tour and reaches to Naugaon which is 13 kms from Lakha Mandal. At Naugaon the route again diversifies to Yamnotri and kamleshwar Mahadev via Purola. This sacred shrine of Kamleshwar Mahadev is situated at the Kedar Katha Mountain. The area is known as Rama Sarai and is believed that this place was established by Lord Rama and Hanuman in Treta Yuga. During Vanvasa lord Rama took rest for a day at Ram Sarai. Filled with peace and experiencing the charm of nature tourists come back to 33 kms Dhanaul via Moorie. At Dhanaul very ancient Mahasudev Temple is worth to Darshan. Mahasudev is considered as Lord Kartike. The temple is surrounded by beautiful peaks and dense forests. All these together have added feather to its charm. In the month of August every year at the temple premises of Mahasudev reverence and grand fair is organized with traditional rituals, dance and music. After having darshan yatri reaches to Barkot, 10 kms from Naugaon via Purola. On the bank of river Yamuna Barkot has a good arrangement of stay and food for the tourists. 2 kms from Barkot a diversion came; one goes to Gangotri via Dharasu and another one heads to Yamnotri via Syanchatti. 29 kms from here falls Syanchatti, situated between high peaks and dense forests it’s a small village. Overwhelmed with a joy of having darshan of Maa Yamuna devotees reach to Hanuman Chatti, 5 kms from Syanchatti. Hanuman chatti is the last bus stop of Yamnotri Dham. From here to Yamnotri the Yatra is of 13 kms. This distance is covered by foot, doli or pony. The joy of having the first sight of temple can’t be expressed in words and whole tiredness vanishes as one find the look of temple. You will spellbind on seeing soft cool water stream on one side and natural hot water spring on other side. In between the two streams situated the sacred Temple of Maa Yamnotri. Maa Yamnotri is daughter of Lord Surya and sister of lord Yama and Shanidev. She is also among one of the 08 Patranis of Lord Krishna named as Kalindi. The festival of Bhaiya Dooj has a deep relation with this Dhaam. This festival is celebrated as the symbol of deep love and relation of Maa Yamuna with her brothers. In this dham there is a divine rock of Maa Yamuna. Near the rock there are three natural hot water tanks named as Surya Kund, Draupati Kund and Gauri Kund. Surya Kund is considered as very important kund, its temperature is 190 degree Fahrenheit. This rare and incredible kund has amazed the whole world. Devotees can cook the uncooked rice in the hot water of the kund which further taken back as the Prasad from Yamnotri Dhaam. Pilgrims can take bath in Gauri Kund, it is believed that one can set free from all sins having a bath here. In the natural hot water spring quantity of sulphur remains high and hence can be harmful by taking a long bath. Yamnotri Dham is situated near the origin of River Yamuna. River Yamuna originates from its source at Kalindi Parvat. 1 kms from Dhaam, source of origin Champasar Glacier and Bandarpoonch glacier which is situated at the height of 4000 ft. The doors of Yamnotri Dham got open on auspicious day of Akshay Tritya and closed in Dipawali due to heavy snow fall. Rest of six month Maa Yamuna is revered at Temple situated in Kharsali village. On Dipawali Maa Yamuna is decorated and is taken to Kharsali by the Raval Pandits. Here the priest of temple is known as Raval. The favourable time for the Yatra is May –October. Now let’s get ready to take your religious tour to Shri Gangotri Dham. 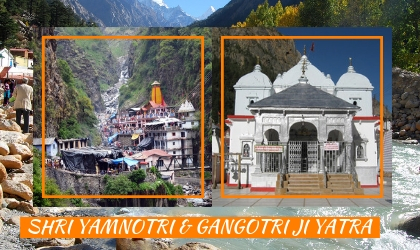 Gangotri is 228 kms from Yamnotri via Dharasu and Uttarkashi. Uttarkashi is 29 kms from Dharasu band and is counted among the most ancient town of world. In Purans and Kedarkhand this town is mentioned as “Barah”. Kashi Vishwanath Temple is very ancient and famous temple of Uttarkashi. From the Asht lipi scripted on the temple it is assumed that the temple has been built in between 5th to 6th century AD. Situating on the foothill of Varunavrat mountain and Bhagirathi river, this beautiful town looks amazing at night. Every year on the occasion of “Magh Mela” huge flock of devotees an tourist gather here and took bath at Bhagirathi Ganga. Maa Kuteti Devi Temple on the hill is also possess a deep religious importance among the natives and is worth watching for views around. Moving ahead 28 kms from Uttarkashi falls Tehsil Bhatwari, from here the route diversify. One goes to Gangotri via Harsil and another towards Dayara Bugyal via Raithal. Bugyal means grass meadows, situated at height of around 10000 ft. Dayara Bugyal present extremely stunning view. At every corner you will see greenery and beautiful flowers blossoming. After enjoying the captivating view of Dayara Bugyal tourist come back and take a halt at Gangnani which is 10 kms from Bhatwari. With Natural Hot water spring, peaceful environment and picturesque view , Gangnani is an amazing tourist spot. Hot water kund with the name of “Rishi Kund” is dedicated to Shri Prashar ji who was father of shri Vedvyas Ji. Continuing your journey toward Gangotri 30 kms from Gangnani Harsil comes. It is situated on the bank of Bhagirathi River. It is an ideal place for night halt and meals. Famous for its wool and apples Harsil is a wonderful place. Bhotia Tribe is the native of this place; livestock breeding is the main business of these peoples. 3 kms ahead from Harsil the devotees reach Dharali. From here the pedestrian route to winter resting temple at village” Mukhwa” of Maa Gangotri starts. At Mukhwa Village Maa Ganga is revered for six months in winter. 20 kms from here the pilgrims reach “Bhairav Ghati”. Covering from dense forest this place is situated at height of 9000 ft . above sea level. This place comprises very well renowned Bhairav Temple. Bhairav Dev is considered as Kotwal of Lord Shiva. Filling joy of Darshan of Maa Ganga in their heart devotees reach Gangotri Dham, which is 9 kms from Bhairav Ghati. Gangotri Dham is situated at the height of 10000 ft. above of sea level. The grand Temple of Gangotri is made up of white granite. Maa Ganga is daughter of Himalya, lord Brahma found her so adorable that he put her into his Ewer. According to Purans to set his ancestors free from sins, king Bhagirath had gone for so hard penance that Maa Ganga had to come on earth. 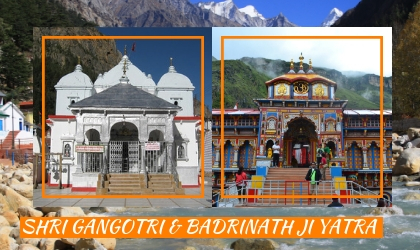 Gangotri is second halt of sacred Chardham Yatra and houses the divine shila of Maa Gangotri. For world peace all the devotees participate in the morning and evening Ganga Aarti. View of Aarti presents such an ultimate aura in the atmosphere that every one lost themselves init. Among the high peaks shrieking stream of Maa Ganga river presents an tremendous view. Every year on the eve of Akshya Tritya the doors of the temple are opened for the devotees and in winter as the place got covered in snow temple got closed. In winter Maa Ganga is decorated beautifully and with a grand procession Maa Ganga is taken to her winter resting Temple at Mukhwa Village. 18 kms trek from Gangotri Dham leads to origin of Maa Ganga at Gaumukh Glacier. On the way you can have glimpse of Barad which is a kind of wild Sheep found in Himalya. 5 kms from here the travellers halt for a short for water, tea or snacks at Bhojwasa. Due to presence of Bhojpatra forests this place is named as Bhojwasa. Bhojpatra is widely used in religious works and reverence. Special permission is required for the trek from forest department. 4 kms from here you will reach to Gaumukh glacier from where the sacred river originates. Tough trek of around 5 kms and at height of 14400 ft. Above sea level comes “Nandan Tapovan”. It is famous for the striking views of Himalayan Peaks and Gaumukh glacier. 1 kms from Nandan Tapovan comes “Neela Taal” which is above 15000 ft. Of sea level. After having the panaromic views, trekking and Darshan of Maa Ganga lets come back to Uttarkashi. From Uttarakashi one route heads 15 kms toward Sangam Chatti. From Sangam Chatti there is a trekking route of 22 kms to “Dodi Taal”. Beautiful pond of Dodi Taal is surrounded by dense pine and oak forests. The natural beauty and legacy of this place can’t be described in words. It is 11000 feet above of sea level. From this pond “Vyas Ganga” originates. At this place the healer of all the obstruction Lord Deodi Gangesha is revered as prime deity. The description of this pond is mentioned in Kedarkhand of Skanda Puran. It is said that every morning for a moment Lord Kuber comes to this place to have a bath on the Dodi Taal. Temple of Maa Annapurana is another must visit site at this place. In between the hills this place holds a great importance. The deepness of the Dodi Taal has not been calculated in any parameter yet. 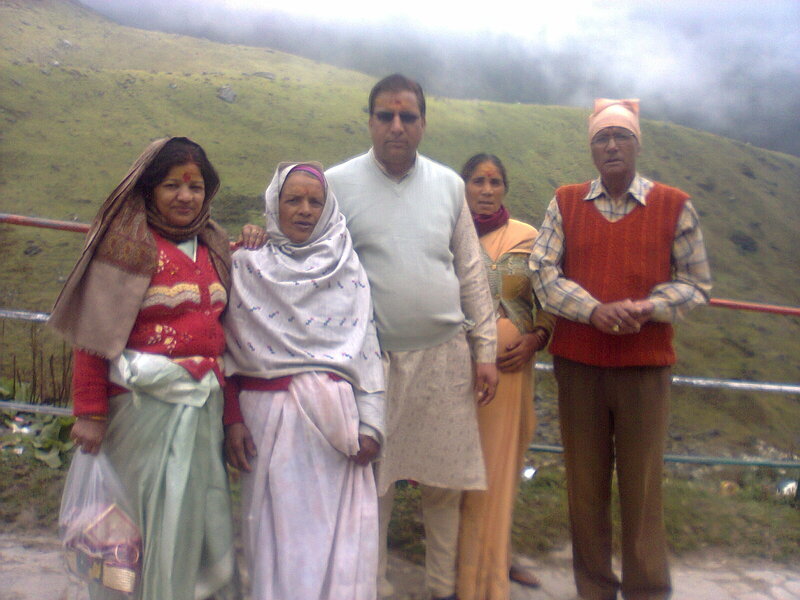 After having Darshan of Maa Ganga the holy pilgrimage heads toward Kedarnath via Shrinagar. Srinagar can be reached via Dharasu and Tehri. There are two more routes to reach Kedarnath one Via Tehri & Ghansali to Tilbara and another one Tehri, Gadolia, Malaitha and Srinagar. Gangotri to rinagar is 225 kms. On the way Malaitha is a small village but carries a great storey of will power and sacrifice. Once a village with no water to irrigate now among some of the most fertile land in Uttarakhand. Just because of the strong will power of a common man who made a tunnel by his own hands in Himalya and sacrificed his own son to bring water in the village. After Malaitha coes Srinagar, it was established in 14th century by King Ajay Pal of Gharwal. Till 1840 Srinagar also remains as the centre of British Gharwal. Situated on the bank of Alknanda river this town is very beautiful and looks amazing. 35 kms from Srinagar comes Rudryaprayag where Allaknanda and Mandakini rivers meet. On the way one route diversify from Chamdhaar to Dewal garh. Devalgarh houses the Temple of chief deity of Uniyal brahmins of Uttarakhand. Here Raja Kumarpal had built a palace and Maa Rajrajeshwari is revered here on the second floor of the palace as main deity. Gaura devi Temple is another important temple here. Along with there are few monuments said to be dated of Pandavas period are also present here. After darshan of Maa Raj rajeshari continue your drive to Rudraprayag. There are five prayags or merging point of Alaknanda river-dev Prayag, Karn Prayag, Vishnu Prayag, Rudraprayag and Keshav Prayag. In Rudraprayag Sheshnaag revered Mahaddev and got the place round his neck. In the ancient temple of Rudranath lord Shiva is revered in his Rudra Avatar. At this place Narad Muni learned music from Lord Mahadev. From here via Tilwara and Agastyamuni side by side one can reach to Ukhimath. Ukhimath houses the winter resting Temple of Shri Kedarnath Ji. Here lord Kedarnath is revered as Omkareshwar. After darshan of Omakareshwar Mahadev devotees reach Guptkshi. Guptakashi is famous for its Ardhanareshwar and Vishwanath temple. 29 kms from Gupta Kashi and 4000 ft above of sea level lies Son Prayag. Son prayag is famous for prayag of river Soan and Mandakini. After sacred darshan 5 kms from son Prayag ccomes Gaurikhand, which is around 75 kms from Rudraprayag. Gaurikund is the place where Mata Parvati had gone for very hard Tapa for Lord Shiva. From Gaurikund 14 kms trek to Kedarnath starts. One can also hire horse, pony, palki or doli to reach the temple. Now a day helicopter facility also been operated from Phata or Agastymune to Shri Kedarnath ji. As one see first look of Shri Kedarnath temple heart got poured with immense devotion for lord Shiva. 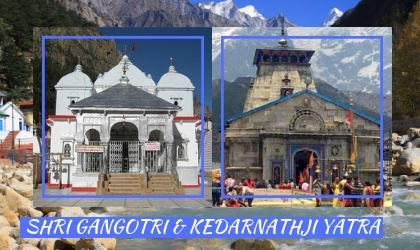 Shri Kedarnath Dham is also one among the 12 Jyotirlingas. This temple is said to be of Pandavas period, as according to Purans for penance and setting free from sin of killing cousin brothers when Pandavas reached this place then Lord Shiva got converted himself in Buffalo. Then Bhim spread his legs from one mountain to another in thinking that Lord Shiva won’t go beneath his legs. On seeing this lord Kedar entered in the earth and his parts appeared on 5 different places which are famous as “Panch Kedar”. Tunganath, Madmaheshwar, Rudranath, Talpeshwar and Kedarnath are the five Kedar. 8 kms trek from Kedarnath leads to Vasu-Ki-Taal at Mandakini glacier. It is appx 13000 ft. Above of sea level. 3 kms of another trekking route from shri Kedarnath ji Temple leads to Chorbitya Taal. It is the place where bones of Smt. Indira Gandhi had been poured and hence the name been changed as Gandhi Sarovar. After having the darshan of Lord Kedar devotees reach to Gopeshwar via Gaurikund. In Gopeshwar famous temple of Shri Gopi Nath is situated. 7 kms from Gopeshwar comes Joshimath where Adi Guru Shankracharya has established his first Matha named as “Jyotirmatha”. 2500 years old Mulberry Kalpa Tree is major point of attraction here. Under the tree there is sacred cave of Adi Guru Shankracharya which now been preserved as a monument. Joshimatha also has an ancient temple of Maa Rajrajeshwari. Grand Temple of Lord Narsimha is prime highlight of the town, during winters the image of Shri Badrinath is revered for six months here. In the image one arm of lord Narshimha is very thin and is said that when the arm from the Murti is separated from that day the Nar and Naryan mountain will collapse together and from then the pilgrims will start visiting “Bhavishya Badri” which is situated in Tapovan. As the devdarshan of Shri Badrinath Dham touches the eyes whole soul got immaculate. Shri Badriinath Dham is also known as Vishala Nagri and Badri Puri. This Dham of Himalya is not only a dham for Sprituality and salvation but also holds and taught lesson of national unity in diversity. Temple of Himalya, Priest from Kerala, saffron of Kashmir and sandal of Karnatka comes to shri Badrinath Dham for Shri Badri Narayan. The temple is situated 11500 feet above the sea level. There is a natural hot water kund called as Tapta Kund here, where the devotee is to believe should take bath before having the Darshan of Shri Badri Vishal. Lantil, gram and ground nuts are among Prasad, this dhaam is moksha dham. Braham kapal is place here where the sacred Tarpan and Pind Daan are carried on by the Pandits for the moksha of one’s ancestors. Mana the oldest village is situated 03 kms from the temple along with Saraswati river . Origination point is also worth watching. It is said that when Shri Vedvyas was narrating Mahabharat to lord Ganesha and he was scripting that then the sound of river Saraswati was annoying them and then Vedvyas curse the river to merge in the earth. Vyas cave and Ganesh cave is the live witness of this event. Along with Bhimpul, Swargarohini and Dropadi temple are also worth to Darshan. Satnam Shri Waheguru lets start for yatra of Shri Hekunt Sahib. Driving side by side of Alaknanda via Vishnu Prayag Govindghat comes. Here after having darshan at Gurudwara the yatra of Shri Hemkunth Sahib ji is continued. Up and down hills trek, astonishing natural views and falling springs presents a thrilling view among the Tourists. Trekking towards Shri Hemkunth Sahib pilgrims take a halt at Ghanghari Village. The villagers of Ganghariya have given an immense contribution to save Valley of flowers. From here the route diversifies and one goes to Flower valley and other continues to Sri Henkunth Sahib. Along with Flower Valley there are some other places are also worth watching. Hemkunth Sahib is the place which Shri Guru Gobind Singh ji has chosen for the Tapa. After having a dip in the sacred pond of shri Hemkund Sahib ardaas is offered at Gurudwara Sahib. Close to gurudwara is situated Temple of Shri Lokpal Lakshaman Ji. Having darshan at Shri Hemkunth Sahib Gurudwara the Yatra came to its final halt via Srinagar, Kirti Nagar and Malaitha to Rishikesh. This city is famous as International Yog Capital and also holds a great religious importance. Its hanging bridges Ram Jhula and Laxman Jhula are centre of attraction among the tourists. Apart from spirituality now Rishikesh is also hub for the adventure activities such as rafting, camping, trekking and bungee jumping. Neelaknth Mahadev Temple is another sacred temple which one should not miss while a visit to Rishikesh. It is the place where lord Shiva gulped the poison came after Samudra Manthan. Neelkanth Mahadev Temple is a masterpiece of architecture The wall of temple shows the entire storey of Samudra Manthan. By road its 30 kms from Rishikesh, one can also reach the temple by 11 kms trek. Filling your heart with peace and delight we Plan Our Travel India Pvt. Ltd. wish for your wellbeing and success. May the almighty fulfils your all the wishes and maintain peace in the world. Har Har Mahadev!!!! Those who have less time can go for Do Dham Yatra. 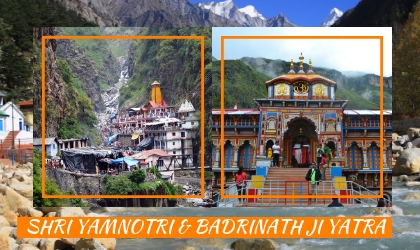 Do Dham generally comprise of doing either Yamnotri, Gangotri Dham yatra together or covering Shri Kedarnath, Badrinath Dham. The package of Do Dham will be short and less hectic for those who can’t go for the long Yatra at a stretch. 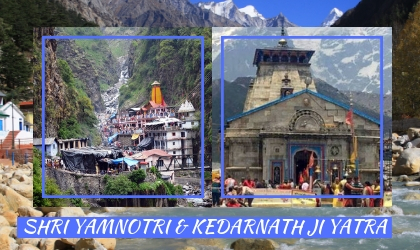 You can also do Do Dham and Char Dham Yatra 2019 by helicopter. Char Dham Yatra - चारधाम यात्रा which is also known as “Chota Char Dham” is among the most pious pilgrimages of India. Millions of tourists flow during the Yatra season. Hence government is very much conscious to make sure that the highway would be in good condition. But as the weather keep on constantly changing at hills there are possibilities that at some place the road repair work or extension would be in progress. Persons travelling by own vehicles are advised to maintain the speed and drive on their side. For the tourists to meet the demand of yatra season private buses added on in the transportation. Every year the government is initiating to make the services better. India’s Primeminister Shri Narendra Modi ji has launched new project for better highway will surely benefit the pilgrims with upgraded standards and services. Special arrangements are made by government to make the sacred Char Dham Yatra 2019 more comfortable and safe. 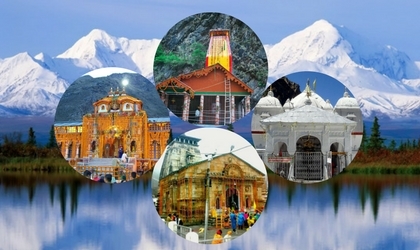 Chota Char Dham yatra 2019 can be commenced from all the prime metro cities. There are direct trains to Haridwar from, Delhi, Mumbai, Chennai and Kolkata. By flight one can reach to Jollygrant via Delhi which is the nearest airport from Haridwar. Road: Haridwar and Rishikesh are well connected by major cities. Haridwar is appx 215 kms from Delhi. Road highway is good. By road one can reach via Gaziabad, Modinagar, Merut, Muzzafarnagar, Rurkee to Haridwar. Rishikesh is just 26 kms from Haridwar. Train: There is daily Shatabdi Train to Hardiwar from Delhi. From all the four corners of India there are trains to Haridwar. Air: Jollygrant is the nearest Airport and has good number of flights from Delhi. It is 38 kms from Haridwar. Accommodation: Ample accommodation within budget and affordable price are available in and on the way of Char Dham Yatra. Many private and government hotels and lodges are available at different destinations. At Haridwar there is good number of chain hotels like Radisson, Sarovar, Country Inn & suites etc are available. The hotels and lodges generally kept well for the season although it is advised not to compare the accommodation at different stopovers with the hotel of planes. As it’s a sacred and religious yatra food served would be only vegetarian. 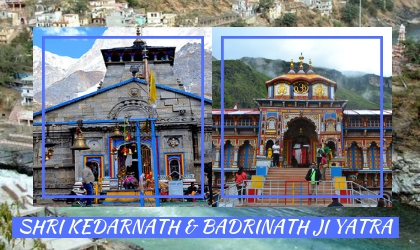 During the Yatra season Helicopter services are also available for Kedarnath and some time for Badrinath. 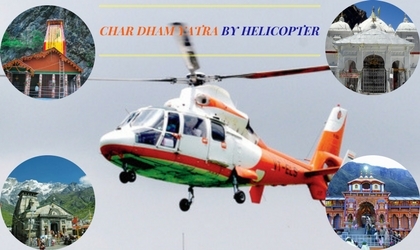 One can also book private helicopter tour for their Char Dham Yatra Package - चारधाम यात्रा पैकेज. The operation of helicopter service depends upon the climate condition. Kindly note that Helicopter Ticket cost for Kedarnath Darshan @INR 7500 + GST. per person on sharing basis (Phata / Sersi – Kedarnath - Phata / Sersi). The opening and closing of the main shrines of this pious yatra has fixed and decided every year. In year 2019 the Scheduled Char Dham dates of opening and closing of the main shrines will be as according to this mentioned chart. Cuisine: Kode Ki roti, Jhangore kheer, Phanu, Knadali ki kafli, Alloo ka thichwani, Arsa, rotana are among must taste dishes of Garwal region which one must taste during their Char Dham Yatra. The food is rich in nutrients and carries rich energy content, which will help you to keep fresh, active and gives you strength. Dance & Music: Uttarakahnd is state where religion is connected with the heart of its people. The impression of which can be seen in the folk dance based on tales of god and goddesses. Dance is generally done in group with Dhol, Damo , Muska Baja (Bagpipe), shehnai, Sarangi , Dholki etc. Men wear traditional Kurta Paijama with sadri and womens desecrated beautiful with traditional saree, blouse with Nathuli, Bulaak, Jhumake, Patwa etc. Fruits: One should not miss to bring Burans juice with them. Burans is state flower and is very beautiful red in color. Hinsar, chuli and Kafal, kingor are other fruits which can be enjoyed during Char Dham Yatra season. Pahari Cucumber is also must eatable item. Shopping: Pahari cap, Handmade articles like purses, shawls, sadri etc. All can be purchased at very nominal rates from Bhartiya Gramothan Sansthan, Rishkesh. This NGO train and make the women self dependent. Spiritual and religious books from Swargashram area, woollen, wodden and brass idols of god and goddesses, maflar are worth to shop from Uttarakahand. Activities: Activities point of view Rishikesh is the perfect place to explore, camping, rafting, kayaking, trekking, bungy jumping, temple tour, yoga classes are some of the activities that Rishikesh offers. Amenities: All the major Bank’s Atm are available at all the halt and towns like Barkot, Harsil, Uttarkashi, Srinagar, Rudraprayag, Badrinath etc. Restaurants, shops, dispensary etc all can easily access at the places. 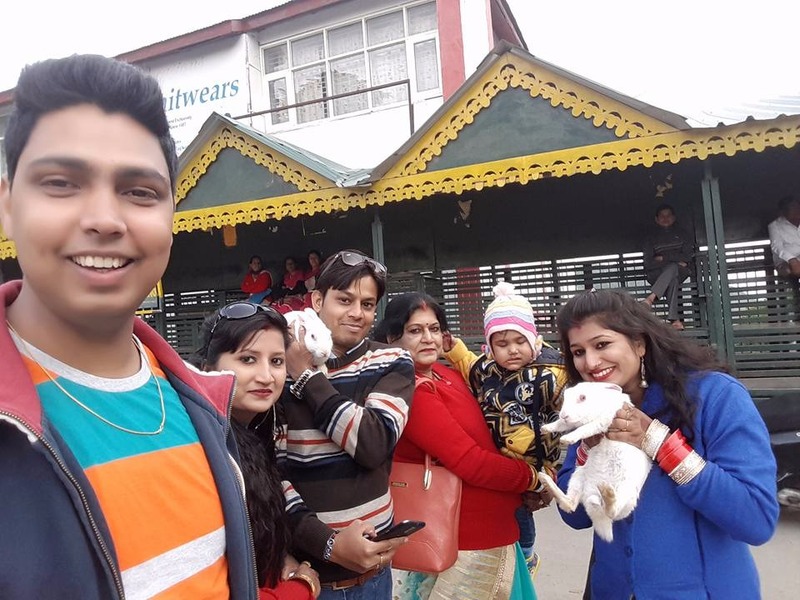 Extension Tours: Yatri can extend their tours to Kumaon region which covers the marvellous natural wonders like Nainital, Ranikhet, Jim Corbett, Jageshwar etc. For those who want sipiritual and intellectual development can go for Vipasana, go for Yoga and meditation sessions. 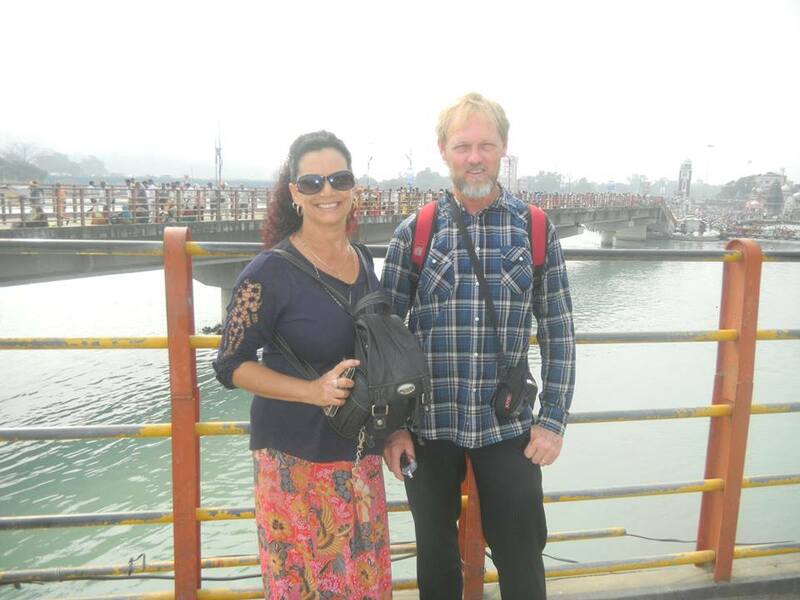 Extend their Tour to Shimla, Kullu, Manali and more ever to Jammu Vaishno Devi. 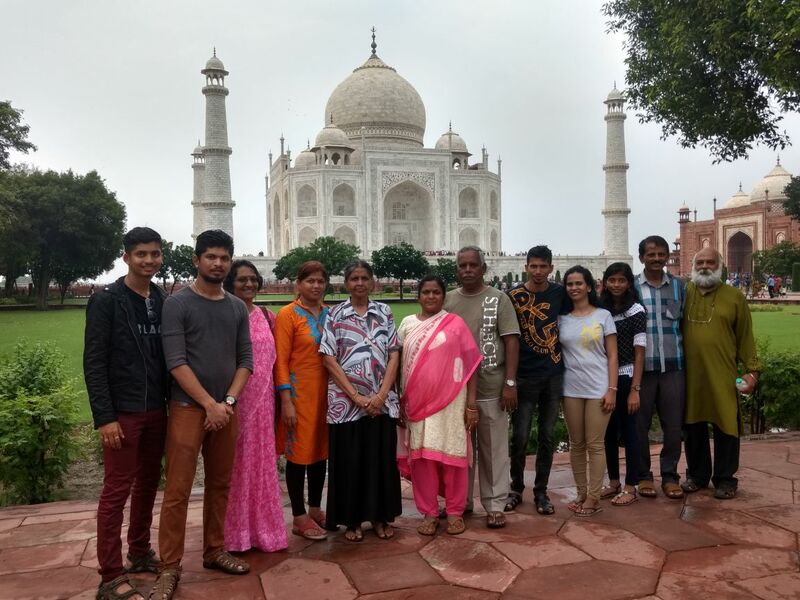 Plan our Travel India Pvt. Ltd cares for you. 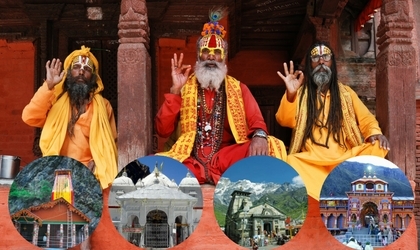 With years of experience and having a team with practical knowledge about the Yatra, we are sharing some must points that need to be noted during the Char Dham yatra. A comfortable, safe and memorable journey is our prime motto and hope that you will go through the below points to enjoy and experience a wonderful yatra. Always use Bathing Ghats to take holy dip at Ghaats, never go to river side alone. Always carry and share your number with you and inform your fellow traveller about your any visit alone. Keep and carry your sufficient medicines if any prescribed by your doctor with you. Government has put lots of efforts to make the Yatra easy, safe and comfortable. Roads are broadened, sign board of turn and safety messages along with speed limits has been provided at the road side and highways. Char Dham Yatra is not just a pilgrimage but a journey of life time; it’s not only to wash away our sins but also for attaining and feeling the ultimate peace of mind and soul. It’s not only to attain Moksha and some people might think that is done by the old people. Million of hearts visit the Char Dham to find out real self, some for peace, some for Yog Sadhna, some for fulfilment of their wish and some to flee from the daily hustle life. As according to people the purpose varies, but yes in all what they can get is complete state of delight and divine content. This year Char Dham Yatra 2019 has come with new and more advancement, safety measures, upgraded medical and emergency assistance for the pilgrims. So for what you are waiting? ?